Upton Town Library : Staff Picks! 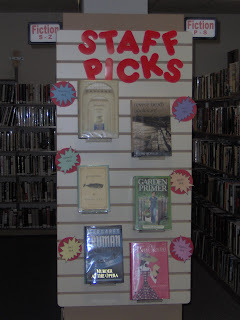 The next time you're at the Library, please be sure to check out our *STAFF PICKS* display! Matthew, Lisa, Donna, Sue, Regina & Eileen each choose a book to put on display, as a suggestion to our patrons . . . Some of the books I've chosen to include so far: Little Earthquakes by Jennifer Weiner (actually I'd recommend ALL of her books! ), 3 books by Roland Merullo: Revere Beach Boulevard, In Revere, In Those Days, and A Little Love Story; Blackbird House by Alice Hoffman.